/GPRS/EDGE and quad-band 3G. An LTE-variant of the device will also be available for supported regions. Samsung's latest Android flagship uses Bluetooth 4.0 alongside Wi-Fi support which includes a/b/g/n, with both 2.4GHz and 5GHz band compatibility. The Galaxy S4 zoom allows you to share all sorts of media via NFC by simply touching the S4 and other later-generation S devices back-to-back. You can share with other NFC devices as well, but functionality is limited to what is provided by the stock Android Beam. The AllShare DLNA functionality, which used to be a standalone application, is now more thoroughly integrated into the respective Samsung applications. To share or access content from nearby DLNA-enabled devices, you do this directly from the My Video app and the Music Player. And finally, for wired connectivity we have the MHL 2.0 port. By all appearances it is a normal microUSB port and works as one (a charger port as well). But the MHL 2.0 port enables video output by using a MHL-to-HDMI dongle. There isn't one included in the retail box and those can be hard to come by. Once you plug the dongle into the phone you also need to plug a charger into the additional microUSB port on the dongle and the Galaxy S4 zoom screen will be mirrored on the TV. The MHL 2.0 port has yet another feature - it features USB On-The-Go. You'll need an adapter for that too (there isn't one in the box) but this one is fairly straightforward - you plug it into the Galaxy S4 Active and plug a standard USB cable on the other end. 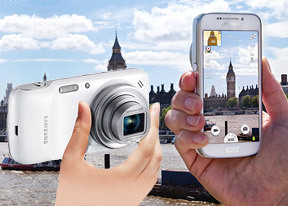 The Samsung Galaxy S4 zoom comes the stock Android browser, which is fast, optimized and packs a good deal of features. The browser supports both multiple double tap and pinch zooming along with the two-finger tilt zoom. There are niceties such as multiple tabs, text reflow, find on page, request desktop site and so on. It even has its own separate brightness slider with an Automatic brightness toggle. The Web browser comes with Incognito mode, which enables you to surf the web without the browser keeping track of your history or storing cookies. Unfortunately, the Quick settings are missing, we quite liked those. Also, Flash is no longer welcome as even the stock browser has dropped support for plug-ins. The Samsung Galaxy S4 zoom features a wide array of advanced features and applications that really make it stand apart from other flagships. One use case is to play a music track on the Samsung Galaxy S4 zoom and use multiple phones as speakers. You can pick the role of each phone (e.g. left channel, right) all the way up to surround sound. This way you can control the music from one phone but use the loudspeakers of all. Of course, the other phones will need to support Group Play - the phones communicate over Wi-Fi (your Galaxy S4 zoom becomes a hotspot that others connect to) and the pairing is done via NFC. Manual pairing is possible too. Finally, perhaps the coolest feature of Group Play is that it allows for multiplayer games to be played on several phones simultaneously. Of course, only supported games work - there weren't any games preloaded on our unit but you can grab some from the Play Store. Moving on, there's Samsung Link, another way to share content between devices. Unlike Group Play, Samsung Link is intended for just your devices - you can link the phone to a computer that is synced with Dropbox, SkyDrive or SugarSync and remotely access content on that device. Anyway, the key element of the app is the IR remote control functionality. The app can control TVs, DVD and Blu-ray players and streaming media players. Devices are organized by rooms. It provides a pleasant interface which gives you an at-a-glance look at your progress, as well as walking, exercise, and fitness trackers. S Health also supports a number of optional accessories, which enables it to give even more detailed info on your status.